On the 19th (Fri), sample the fine beverages at Kangaroo Island Spirits and then enjoy the sand and surf at Stokes Beach. Keep things going the next day: look for all kinds of wild species at Raptor Domain and then identify plant and animal life at Seal Bay Conservation Park. For more things to do, maps, and more tourist information, read our Kangaroo Island trip builder site . Sydney to Kangaroo Island is an approximately 5.5-hour flight. You can also do a combination of car and ferry; or do a combination of train, bus, ferry, and taxi. Finish up your sightseeing early on the 20th (Sat) so you can travel to Albany. Start off your visit on the 21st (Sun): explore the striking landscape at The Gap and Natural Bridge, then kick back and relax at Cosy Corner Beach, then do a tasting at Forest Hill Vineyard, and finally enjoy the sand and surf at Greens Pool. Here are some ideas for day two: explore the striking landscape of Waychinicup National Park. To find other places to visit, photos, traveler tips, and more tourist information, you can read our Albany road trip tool . Fly from Kangaroo Island to Albany in 9 hours. Alternatively, you can do a combination of flight and bus. You'll gain 1 hour traveling from Kangaroo Island to Albany due to the time zone difference. In April, daily temperatures in Albany can reach 25°C, while at night they dip to 13°C. Cap off your sightseeing on the 22nd (Mon) early enough to go by car to Margaret River. Your itinerary includes some good beach time at Surfers Point and Meelup Beach. Visiting Sugarloaf Rock and Mammoth Cave will get you outdoors. Change things up with these side-trips from Margaret River: Augusta (Cape Leeuwin Lighthouse & Jewel Cave) and Ngilgi Cave (in Yallingup). 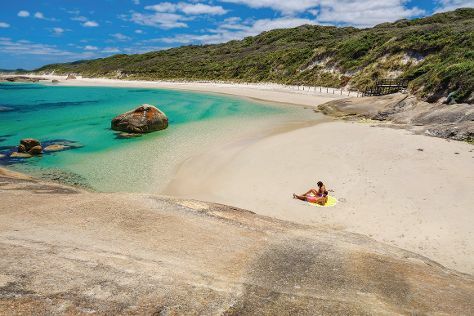 And it doesn't end there: enjoy the sand and surf at Cowaramup Bay, indulge your senses at some of the top wineries in the area, Head underground at Lake Cave, and stroll through Hamelin Bay. To find other places to visit, more things to do, maps, and more tourist information, go to the Margaret River road trip app . Traveling by car from Albany to Margaret River takes 4.5 hours. Alternatively, you can take a bus; or do a combination of flight and bus. Cap off your sightseeing on the 26th (Fri) early enough to travel to Coles Bay. Start off your visit on the 27th (Sat): take a memorable tour with Tours and then kick back and relax at Wineglass Bay Lookout. Keep things going the next day: look for all kinds of wild species at East Coast Natureworld and then get a dose of the wild on a nature and wildlife tour. To see reviews, maps, more things to do, and other tourist information, read Coles Bay trip itinerary app . Traveling by combination of bus and flight from Margaret River to Coles Bay takes 15.5 hours. Traveling from Margaret River to Coles Bay, you'll lose 2 hours due to the time zone difference. Wrap up your sightseeing on the 29th (Mon) early enough to travel back home.